This will be a complete multi-part guide on everything you will need to live stream your church service. Make sure you check back often for additional updates and expansions to this guide. Now before we get started, the goal of these posts will be to share what I've done for my home church and many other clients. Hopefully, I will save you some time a research as well as help you avoid the issues I ran into while trying to set up a professional looking stream that is reliable and is a blessing to my home church and my other clients. Any equipment suggested will be listed at the end of each post with Amazon affiliate links to each item mentioned. If you have any questions email me here or leave a comment. Also, consider subscribing to my social media channels. I plan to make video versions of these posts as well. Let's get started. Are you live streaming for your sick and shut in, convenience, to reach more people with your church's message or just to keep up with the times? There is no right answer to this question. I ask it just so we have a target for our end goal. There is no point in setting off on something if we don't have a marker to determine if we successfully accomplished the task. Personally, at my church, I wanted to live stream because being a tech nerd, I knew that to reach a younger group we needed to embrace relevant technology. I turn 40 this year, so I have kids in school, afternoon activities, I have a wife on a rotating work schedule and a thriving business that has me going to different locations almost every weekend. Now if that is me, I am sure others are the same way and going to your home church every Sunday is not always an option nowadays. So my thought was why not offer our worship experience to our members when they are unable to physically be at church? To live stream successfully we need to verify our speeds from our ISP (internet service provider). 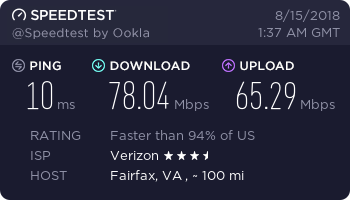 In my area, there is Comcast and Verizon FIOS. 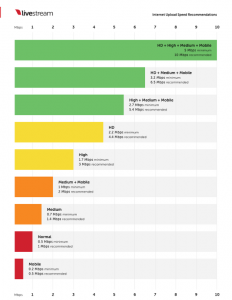 Technology has changed so fast that it is essential to check with your ISP on new and faster speed options. You could be grand-fathered into paying for a slower package that you could be getting a much faster speed. First things first, get WIFI out of your mind. My goal is to help you with a reliable professional live streaming setup and using a WIFI connection to live stream just will not cut it. ALWAYS use a wired connection if you can. You can get a 100-200ft ethernet cable from Amazon.com and run a dedicated line to your streaming equipment if need be but please please please do not try to live stream over WIFI. Now at your church, on any computer hardwired to your internet connection go to www.speedtest.net. Personally, I think you should aim to stream at HD + Medium + Mobile so that would mean that we need a CONSISTENT upload speed of 5.4 Mbps. Now to be on the safe side, unless your church's internet connection is dedicated to live streaming and no one else will ever use it, we need to bump this number up. I feel that you need to have a minimum of 30 Mbps upload speed. That should be a good cushion for handling a good quality HD stream. In my next post I will go over the essential gear needed to stream that video over the internet, PCs, capture cards and software; oh my! If this article/series helped you, consider sharing it. Also, consider subscribing to my social media channels to get more content that can help your church or media ministry.